The magazine was intended to entertain, inform and educate the women of America. In addition to extensive fashion descriptions and plates, the early issues included biographical sketches, articles about mineralogy, handcrafts, female costume, the dance, equestrienne procedures, health and hygiene, recipes and remedies and the like. Each issue also contained two pages of sheet music, written essentially for the pianoforte. Gradually the periodical matured into an important literary magazine containing extensive book reviews and works by Harriet Beecher Stowe, Edgar Allan Poe, Nathaniel Hawthorne, Henry Wadsworth Longfellow and many other celebrated 19th century authors who regularly furnished the magazine with essays, poetry and short stories. Godey’s Lady’s Book also was a vast reservoir of handsome illustrations which included hand-colored fashion plates, mezzotints, engravings, woodcuts and, ultimately, chromolithographs. In 1836 Godey purchased the Boston-based American Ladies’ Magazine which he merged with his own publication. Most importantly, Sarah Josepha Hale (1788-1879) became the new editor of Godey’s Lady’s Book. Mrs. Hale brought substance to the magazine, and wrote frequently about the notion of “women’s sphere.” In 1846 she stated, “The time of action is now. We have to sow the fields—the harvest is sure. The greatest triumph of this progression is redeeming woman from her inferior position and placing her side by side with man, a help-mate for him in all his pursuits.” Her steadfast devotion of purpose and her unwavering editorial principles regarding social inequalities and the education of American women, made her one of the most important editors of her time. Under Mrs. Hale’s tutelage the magazine flourished, reaching a pre-Civil War circulation of 150,000. Godey and Hale became a force majeure in American publishing and together produced a magazine which today is considered to be among the most important resources of 19th century American life and culture. This most successful publisher-editor relationship lasted for over 40 years. Louis A. Godey died on November 29, 1878 and Sarah J. Hale five months later, on April 30, 1879. It is interesting to note that they were both interred at Laurel Hill Cemetery overlooking the Schuylkill river. This collection provides the complete run of Godey’s Lady’s Book, and is the only one containing the color plates as they originally appeared. Our search and retrieval system allows searchers to limit by “Image Type,” which includes chromolithograph, color plate and color plate fashion, as well as advertisement, cartoon, drawing, engraving, fashion plate, illustration, map, mezzotint, portrait, sheet music, table and woodcut. Particular consideration is due to The Athenaeum of Philadelphia, The Library Company of Philadelphia, Winterthur Library, and The Chester County Historical Society, without whom this project would have been impossible. Dr. Roger W. Moss kindly permitted the use of the Athenaeum’s most important family set of Godey’s as a guidepost for this project. Many of the plates were copied from this collection. 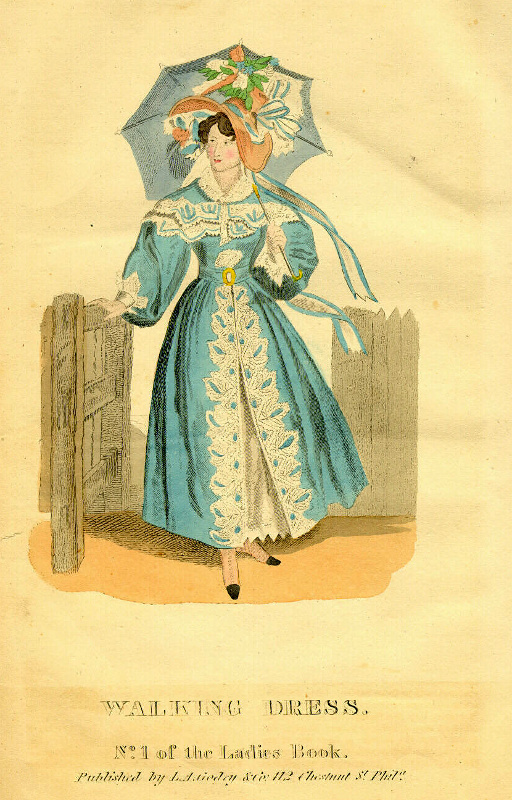 Read posts about Godey’s Lady’s Book in the Accessible Archives Blog.